Affectionately called our “Littles”, they are the youthful faces that warmly greet you at our front desk. Who knew high schoolers could be so driven and responsible, plus be total rock stars on the bike! Grace, Halle, and Maeve have spent nearly a year with us and we’ve gotten to watch them navigate the college application process. Pedals were turning extra fast there for a while as they anxiously waited for those acceptance letters. Now they’ve got news to share, so you too can join the celebration before they head off to school in August. Let’s cut to the chase. You each now know where you’re headed to college. Share your news! 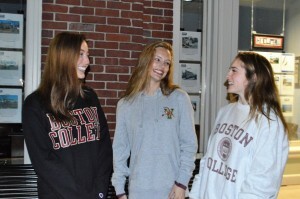 Grace: I’ll be heading to Boston College in the Fall in the Connell School of Nursing! I’m so excited for all the football and hockey games and can’t wait to meet new people and take advantage of all the new opportunities I have! Halle: I’m headed to UVM this fall! I am very excited to go because not only have I wanted to go there since I was a kid but I’m a big skier and love the snow and being outside. 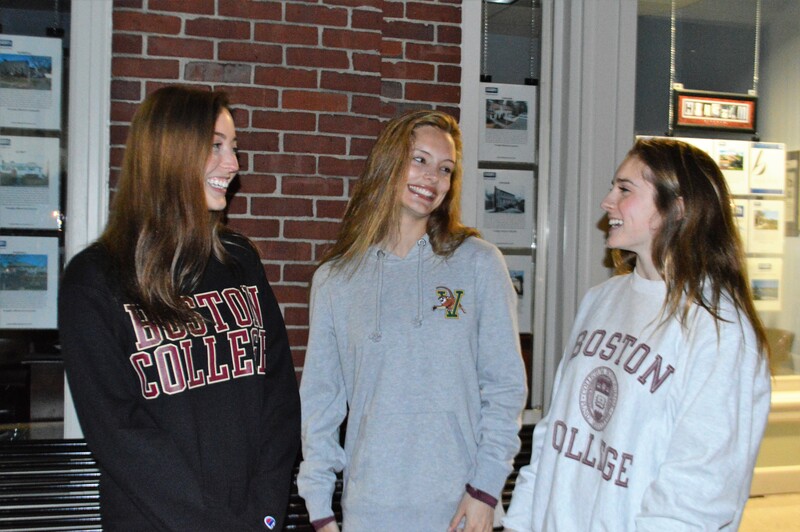 Maeve: I chose BC because it gives me the best of both worlds. I’ve always been wicked close with my family and have never imagined shipping out to say the West Coast for college, but I want to experience this new chapter away from home as well. 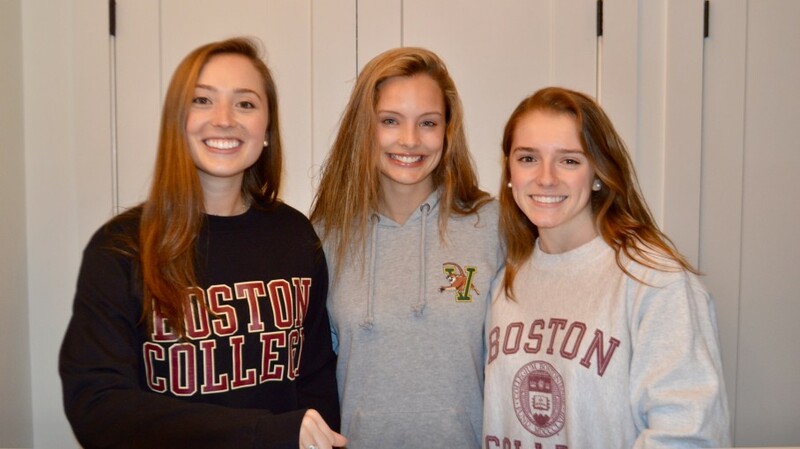 With BC I am close enough that family is reachable, but far enough away that I don’t have to see them 24-7;) I also have always imagined myself going there since my dad graduated from BC, and told me all of his favorite memories there. Go eagles!! What kinds of sports and fitness have you been involved in as you’ve grown up? Grace: I used to be a part of the rowing team at the high school but after my sophomore year I was injured and had to stop. Ever since, spinning has been a huge part of my weekly routine and can’t imagine what I would have done without it. I also run often and just finished the NYC half-marathon in March! Halle: Growing up, I ski raced in Southern Vermont and played club and town lacrosse. Also, my lacrosse coach is a personal trainer at CrossFit and likes to make up insane workouts for us. Maeve: Growing up I tried many different sports. I played basketball since first grade until I stopped sophomore year, I swam competitively until eighth grade, I have played volleyball since sixth grade, and I rode horses up until seventh grade. But it wasn’t until Cycle Town that I started “working out”. What about Cycle Town hooked you? Grace: Cycle Town hooked me because not only can I count on getting a great workout every time I come but the people I’ve met through Cycle Town are some of the most genuine and caring. The Cycle Town community is one I’m proud to be a part of. Halle: I was immediately hooked at Cycle Town because of the sweat and music. Nothing feels better than walking out of there drenched in sweat. Maeve: The thing that hooked me at Cycle Town was definitely the music. I had never experienced a fifty minutes of brutal physical activity that was FUN. The music made the time fly, and now I dread having to workout outside of spin haha. What advice do you have for fellow high schoolers starting out riding? Grace: My best advice would be to keep with it. I remember the first time I came I had a really hard time but every time I came back it got better and better and now spinning is one of the best parts of my day. Halle: For any highscholler starting out, if you need to sweat it out or find some new music, this is the place for you. The great people make it even better. Maeve: If I were to give other high schoolers starting out any advice it would be to stick with it. I have seen incredible changes in my body since I started riding here, but you have to trust in the process. I felt awkward on the bike at first, but after a few classes I started to get the hang of it. Halle: My favorite move on the bike has to be a straight climb or squats! Maeve: My favorite move on the bike is definitely the lunges (and figure eights). I love when the whole class is hitting the beat so perfectly, and this move makes the heavy weight that much more bearable. Favorite song(s) to ride to? Grace: My all time favorite song to ride to is Whip it. Halle: My favorite songs on the bike range anywhere from upbeat house and edm to a classic 70s/80s throwback. Maeve: Recently, I’ve loved riding to Slide by Calvin Harris. Some of my favorites are Pour Some Sugar On Me, anything Britney, and the Rihanna remix of Pony.